OPEN Dalston: DalstonArts150 is kicking off. Unmissable! DalstonArts150 is kicking off. Unmissable! This short film gives a Dalston background story and an explanation of why the character, cultural uses and affordability of the area is again under threat from "regeneration"
On Saturday 2th June there's an exhibition opening about Dalston's cultural and architectural heritage and the battles to preserve it over recent years. The exhibition is hosted by the Bootstrap Company in the Reeves and Sons Printhouse Gallery,18-22 Ashwin Street E8 from Saturday 2nd June until Saturday 9th June. You can visit between 9am to 11pm on weekdays (until 4pm only on Monday Tuesday and Wednesdays and from 3pm on weekends). There will be several films, maps and photographs ancient to modern, campaigner's literature, artists artifacts, contemporary art works and lots more. Unmissable! 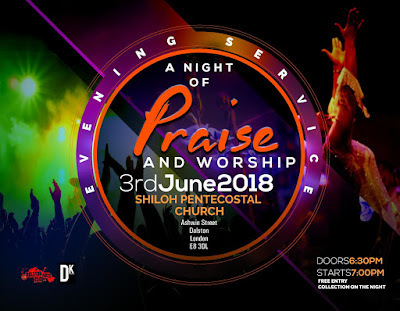 An invitation from Pastor Francis Lewis of Shiloh Pentecostal Church to visit this historic building and to hear their fabulous Gospel Choir arranged by its musical director, and drummer, Jonathan Tuitt. Don't miss this! On Sunday 3rd June at 6.30pm the doors of the 1871 Shiloh Pentecostal Church will open to welcome everyone, of all faiths and none, to see inside one of Dalston's best preserved heritage buildings and to hear, starting at 7pm, one of London's finest and vibrant Gospel Choirs lift their voices to the heavens. 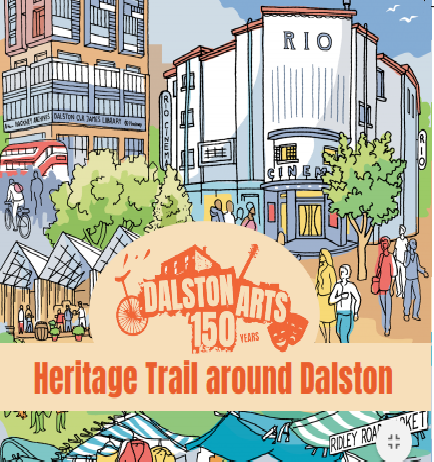 In the Eastern Curve Garden you can pick up the beautifully designed and illustrated DalstonArts150 Heritage Trail map which will guide you around local places and tell some of their stories (And secrets. Ed.). And if you'd like a personally guided walk lead by local sage Sean Gubbins, email him on sean@walkhackney.co.uk. His affordable tour will begin outside Reeves and Sons Printhouse Ashwin Street at 1pm on Saturday 2 June. Other events coming soon will include local artists' open studios, an arts and crafts makers fayre and, hosted by Cafe Oto, there will be special film and music events including a screening of "Legacy in the dust - the Four Aces story" and an attempt on the world record for the longest continuous performance of improvised music. The attempt will need everyone locally, of all ages and abilities, who can sing, play, pluck, strum, bow, strike, blow or tickle anything resembling a musical instrument to bring it to to the event. More details of the events will follow as they emerge. reminisced at the Stones' London Stadium concert on Tuesday about a long-lost local venue, Dalston Baths (or, as he puts it, “a place near ear called Dalston Barfs"). Does you sage remember that one? Yes - very interesting indeed, I thought. It appears Jagger was conflating two gigs that the Stones played on the same evening - 23rd November 1963 - the first at Leyton Baths, the second at the Chez Don Club at the old cinema at 538-540 Kingsland Road (now a bar called - in the Dalston fashion - 'Untitled'). Thanks for this and for the link Jules. Seems you are right and that's why nothing came up when i googled "Dalston baths". I suppose it was nearly 55 years ago and although he's from Dartford, I don't get the impression he spent a lot of time in Hackney or Waltham Forest during his life....but the recent gig sparked the memory of that evening.